Nicolas Colombel (1644–1717), Hippomenes and Atalanta (c 1680), oil on canvas, 141 × 127 cm, Palais Liechtenstein, Vienna, Austria. Wikimedia Commons. In the central story of Book 10 of his Metamorphoses, Ovid told of the origin of myrrh, and the birth of Adonis from the wooden womb of the tree into which his mother, Myrrha, was transformed. The author next tells of the love affair of Adonis and Venus, into which he injects the story of a race between two fine young people. Adonis grew up to be a most beautiful young man. When Cupid was kissing his mother Venus, one of his arrows grazed her breast, and set her heart on fire for the young Adonis. Venus shunned her place with the gods, and spent her time on earth with Adonis. She warned him to keep clear of wild beasts, in order to remain safe. He questioned that, and Venus then told him the story of the race between Hippomenes and Atalanta. As a girl, Atalanta always outran the boys. But she had been told by an oracle that she should not marry; if she did not refuse a husband’s kisses, then she would be deprived of her self. She therefore lived alone, and issued the challenge that she would only marry the man who was faster than her, and beat her in a running race. Hippomenes was the great-grandson of Neptune, a fast runner, and when he saw Atalanta’s lithe body, fancied he might be able to beat her, and so win her hand in marriage. When he saw her run, though, he realised how fast, and beautiful, she was. He challenged her. When she had looked him over, she was no longer sure that she wanted to win, thinking whether she might marry him. But she was mindful of the prophecy, and left in a quandary. Hippomenes prayed anxiously to Cytherea (Venus), seeking her help in his challenge. She gave him three golden apples from a tree in Cyprus, and instructed him how to use them to gain an advantage over Atalanta. The race was started with the sound of trumpets, and the two shot off at an astonishing pace. Atalanta slowed every now and again, to drop back and look at Hippomenes, then reminded of the prophecy, accelerated ahead. Hippomenes then threw the first of the golden apples, which Atalanta stopped to pick up. This allowed Hippomenes to pass her, but she soon caught him up and went back into the lead. He repeated this with the second golden apple, and again Atalanta stopped to retrieve it, lost her lead, but caught it back up. On the last lap, he threw the third apple even further away. Venus intervened and forced Atalanta to chase the apple still further this time, and made it even heavier to impede her progress. This allowed Hippomenes to win the race, and claim Atalanta as his prize. and with their tails they swept the sandy ground. a bridal-room to their ferocious taste. whose harness has subdued their champing jaws. For their desecration of a holy place, Atalanta and Hippomenes were transformed into the lions which now draw Cybele’s chariot. Venus completes the story by telling Adonis that this is the reason that you should beware of lions and other savage beasts. Venus and Adonis as a couple have been very popular indeed as motifs in painting, and I will defer showing the best examples to the next article in this series, which brings their story to its conclusion. It is a long time since any significant painting told the story of the race between Hippomenes and Atalanta, but for a while, mainly in the seventeenth century, it was quite popular – as it should be, given its graphical story and the opportunity to paint athletic figures. Guido Reni (1575–1642), Hippomenes and Atalanta (1618—19), oil on canvas, 206 x 297 cm, Museo Nacional del Prado, Madrid, Spain. Wikimedia Commons. Guido Reni’s Hippomenes and Atalanta from 1618—19 shows Atalanta picking up the second of the golden apples. Devoid of extraneous details – the spectators are shown as token figures only – the artist concentrates on their form, specifically the alignment of their limbs and bodies. He includes some wonderful echoes, such as in their right arms, and his right hand with her left hand. There are also some effective contrasts, between their legs and the alignment of torsos, which emphasise their relative motion. Jacob Peter Gowy (c 1610–after 1644), Hippomenes and Atalanta (1635-37), oil on canvas, 181 x 220 cm, Museo Nacional del Prado, Madrid, Spain. Wikimedia Commons. 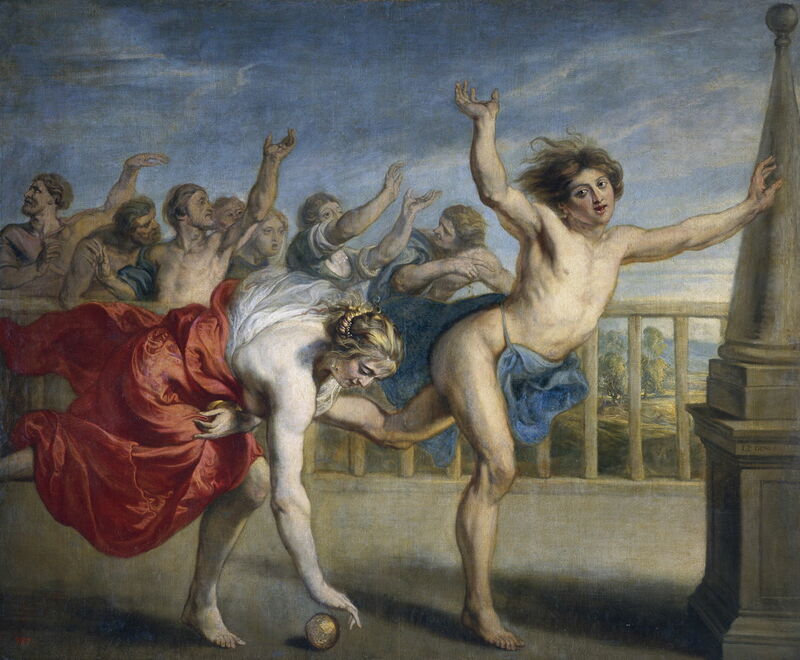 Jacob Peter Gowy’s Hippomenes and Atalanta (1635-37) also chooses the moment that Atalanta is picking up the second golden apple, but has distracted a little with the crowd of onlookers waving and cheering behind. The body language is not as clear, and the juxtaposition of the runners has some awkward moments: it looks as if Hippomenes’ left foot is kicking Atalanta’s left side, for example. But there is more excitement and the atmosphere of a contest here. Nicolas Colombel, in his Hippomenes and Atalanta from about 1680, has set the pair into an elaborate landscape, and added a winged Cupid to hint at the stakes. Atalanta is, yet again, just about to collect the second golden apple, and there is less ambiguity in the overlap between the two figures. Noël Hallé’s The Race between Hippomenes and Atalanta (1762-65) goes even further, in almost every respect. The scene is now of almost epic proportions, spread across a panoramic canvas. At the right are the local dignitaries, and a winged Cupid as a statue, watching on. 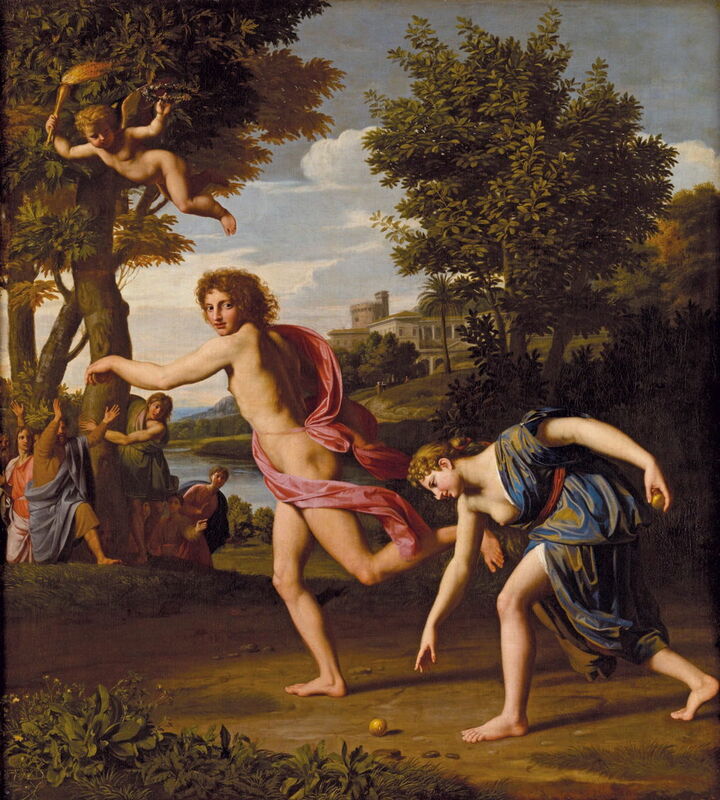 Atalanta is still, though, picking up the second golden apple, with Hippomenes holding the third behind him, in his right hand, as if he is about to drop it. These are four fine paintings, but leave me with a puzzle: why does each of them choose the moment that Atalanta is picking up the second of the golden apples, rather than the third? We know from Ovid’s text that at this stage, the race is not yet lost for Atalanta. Indeed, she comes through to take the lead again. Neither has the really sneaky divine intervention taken place, and made the slower runner the champion. In showing the race, none of the artists gives us a hint of the couple’s eventual fate, after their ill-advised misuse of the old shrine. 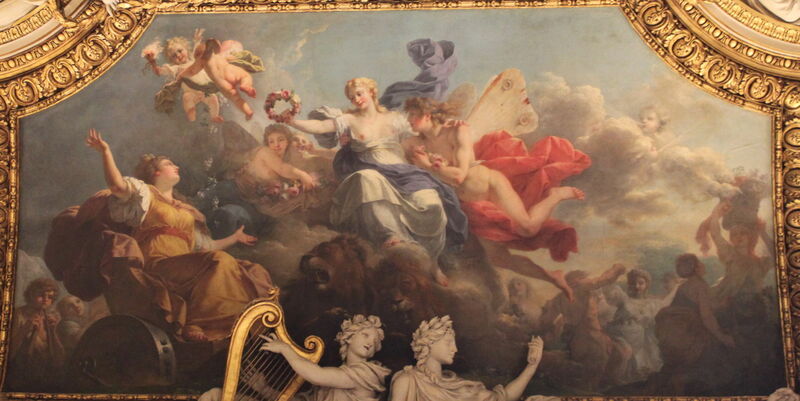 It takes Antoine-François Callet’s magnificent Spring, or Zephyr and Flora Crowning Cybele (1780-81), now adorning the ceiling of the Galerie d’Apollon in the Louvre, to show the two lions drawing Cybele’s chariot, and bring closure to the story. Antoine-François Callet (1741-1823), Spring, or Zephyr and Flora Crowning Cybele (1780-81), oil on canvas mounted on ceiling, 53.5 x 96.5 cm, Galerie d’Apollon, Musée du Louvre, Paris. Image by Faqscl, via Wikimedia Commons. Posted in General, Language, Life, Painting and tagged Callet, Colombel, Gowy, Hallé, Metamorphoses, myrrh, myth, narrative, Ovid, painting, Reni. Bookmark the permalink. It is the next myth told in Book 10 of Ovid’s Metamorphoses, which I am working progressively through. It is also one of the more unusual myths, which I think gives insight into Ovid’s very progressive ideas about women: far from Hippomenes winning outright, he had to resort to deception in order to get the better of Atalanta. But both of them are then punished for his offence against the gods. Ovid often comes through as being quite an ardent feminist – which for over two millennia ago is quite a surprise. Wow that’s really great Howard 😊. Please do continue and all the best !! Return of the zombie app: is it a feature or bug?